Bachirou Amma has been the proud owner of second division club Nassara AC, in Niger, since 2008. He had always been an avid football fan, and decided that there was no better way to pursue his hobby than to open a club in his hometown of Agadez. Bachirou used to be involved in the migrant smuggling business. When the 36/2015 law against the smuggling of migrants was introduced, he turned all his attention to football. 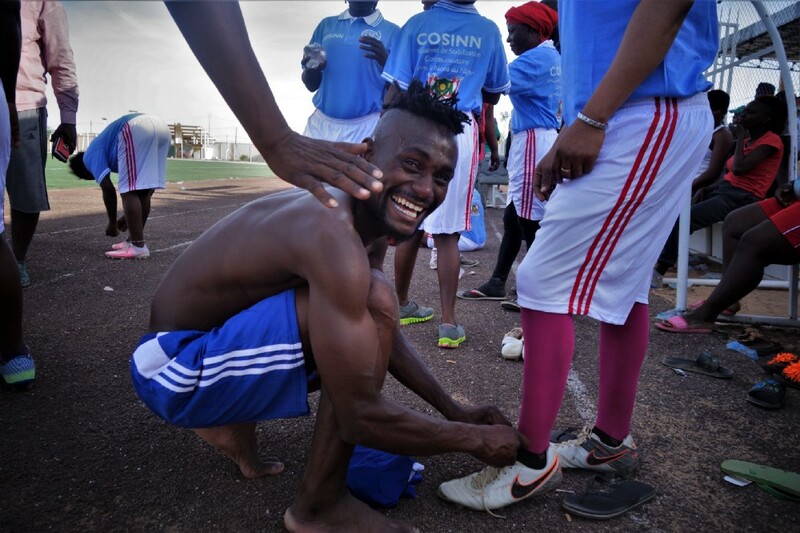 There are six migrants playing on his team currently, most of whom have been recruited for the team by current or ex-smugglers during visits to the ghettos in Agadez. Other times, the migrants themselves come and tell Bachirou that they want to play. Once the migrants decide to join the club, he moves them from the ghettos and provides them with basic housing, amenities and a salary. Bachirou knows the dangers of irregular migration better than most people. During the training sessions at the club, he teaches his players about the risks of irregular migration and its alternatives. He also refers them to an orientation office and transit centre run by IOM, the UN Migration Agency. Last year, 17 of the 18 migrants playing for Nassara AC decided to go back home instead of pursuing trips to Libya, Algeria, and beyond. 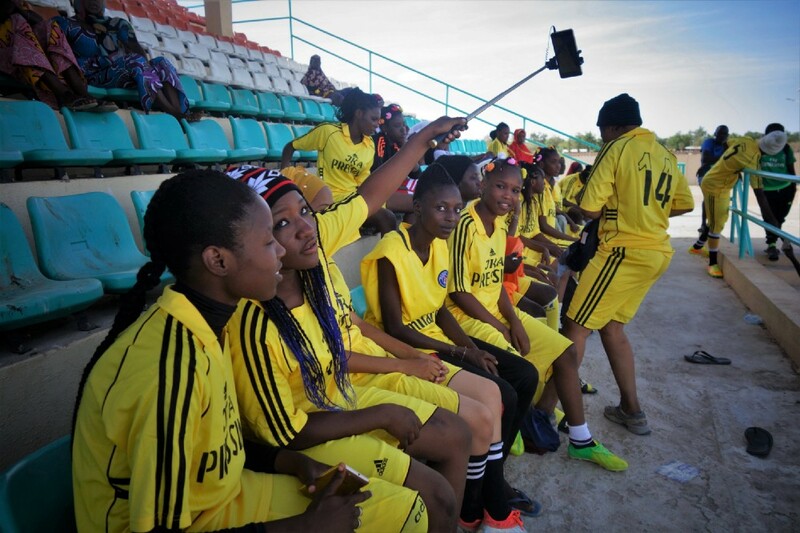 Bachirou is proud to be one of the few football club owners to run a women’s team — it is the only one in Agadez. The women’s junior team has been active in Agadez for two years. The players may be young, but they are tough. They go to school every day, and still find the energy to train every day under the scorching Niger sun. 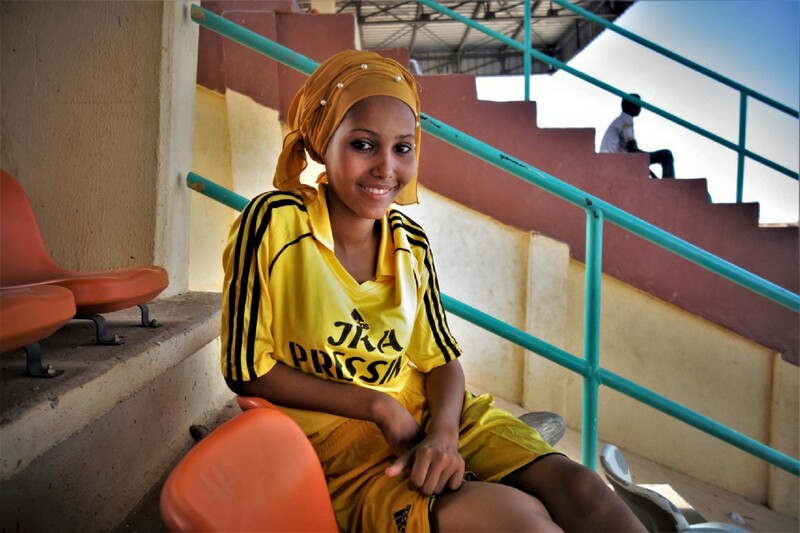 Sixteen-year-old Zeinab, also known to her friends and fellow players as “Messi”, was born and raised in Agadez. She has been playing for Nassara AC for the past three years. She started playing football a few years ago during break time at school, and her passion soon evolved into a career interest. Last year, she was chosen to go to a football camp in the US. “I loved it there; they really value football and the skills players have,” she said of the experience. Her family couldn’t be prouder of her, especially her dad who is a big football fan. “We both love Barcelona and Messi!” Zeinab said of their shared interest for the sport. Despite her nickname, she sometimes feels like she might not be the best player on the team anymore, even though all her friends point at her when they are asked who dominates on the field. “The little ones that just started playing might have surpassed me,” she said with a laugh. Zeinab loves football, but also has big dreams of becoming a doctor one day. Under IOM’s community stabilization project COSINN, both of the Nassara teams (male and female) get to play regularly against others from different regions, but also against migrants from the transit centre. 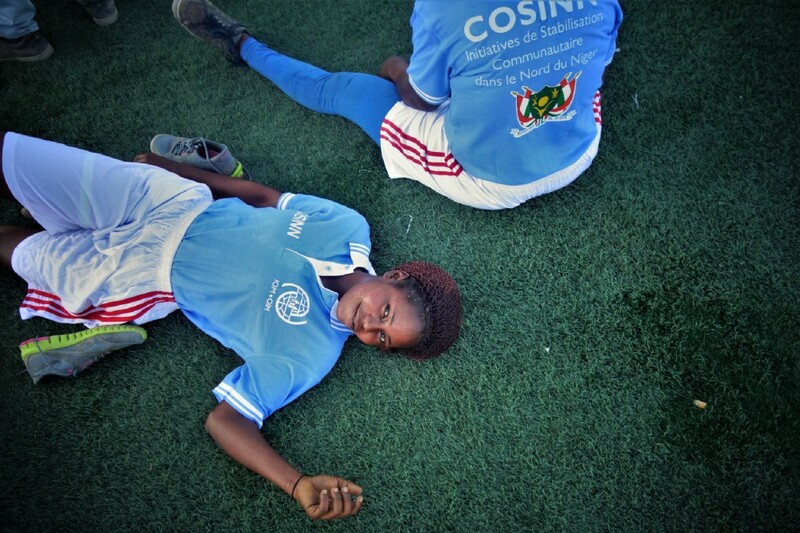 This year on 13 May, Nigerien Women’s Day, several women came together for a game, but they were also united by a common experience: the hardship of irregular migration. The women were part of a larger group that had recently arrived from Algeria. Claire, 30, was part of that group and she had lived in Algeria for one year. When trying to get back to Cameroon, her group was abandoned in the middle of nowhere, near the border with Niger. “When I left Cameroon, I told myself that I could find better abroad,” Claire said. “I couldn’t; I only found something worse.” Claire and her group had to walk for 18 kilometres under the desert sun until they found shelter in Assamaka. Some were close to dying, some were pregnant, and some were both. Claire will stay in Niger until her travel documents are ready and she can finally go back to Cameroon. “I couldn’t be happier, I can’t wait to be back home,” she said. 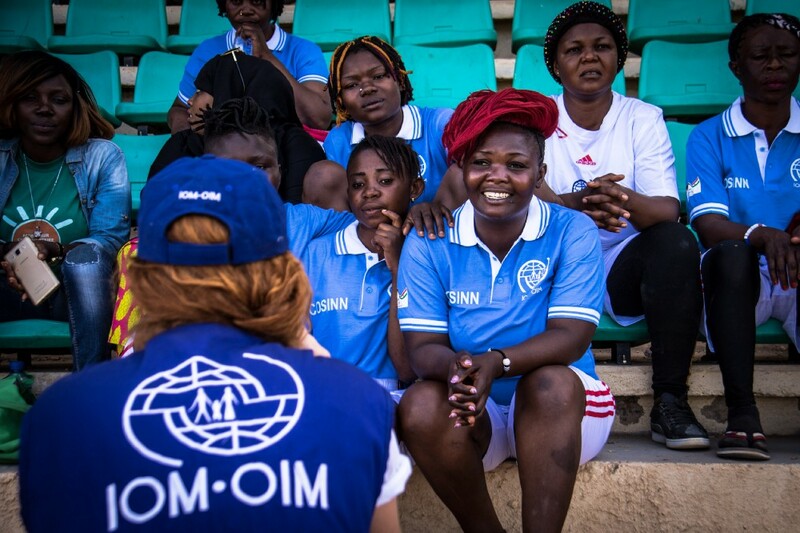 When she plays with Nassara AC, fans from the area come to support their team, and so do the men and women staying at IOM’s migrant transit centre in Agadez. As Zeinab put it, “football is football anywhere in the world.” It is not always about winning or losing; at the transit centre, it is about a group of women who want to play sport together. The activities organized for Nigerien Women’s Day were sponsored under the project “Community Stabilization Initiatives in Northern Niger” (COSINN) funded by the German Federal Foreign Office. IOM’s Community Stabilization (CS) programme aims to support governments and civil society actors in reducing the factors that lead to irregular and forced migration, integrating the needs of marginalized groups and host communities, and responding to the impact of migratory flows on communities. IOM’s six transit centres in Niger are supported by the Migrant Resource and Response Mechanism funded by the EU Emergency Trust Fund for Africa and co-financed by DANIDA, the German Cooperation and the governments of Netherlands and France. This story was written by Monica Chiriac, Public Information Officer at IOM Niger.